Fluids rich in water, carbon and sulfur species and a variety of dissolved salts are a ubiquitous transport medium for heat and matter in the Earth’s interior. Fluid transport through the upper mantle and crust controls the origin of magmatism above subduction zones and results in natural risks of explosive volcanism. Fluids passing through rocks affect the chemical and heat budget of the global oceans, and can be utilized as a source of geothermal energy on land. Fluid transport is a key to the formation and the practical utilization of natural resources, from the origin of hydrothermal mineral deposits, through the exploitation of gaseous and liquid hydrocarbons as sources of energy and essential raw materials, to the subsurface storage of waste materials such as CO2. Different sources of fluids and variable paths of recycling volatile components from the hydrosphere and atmosphere through the solid interior of the Earth lead to a broad range of fluid compositions, from aqueous liquids and gases through water-rich silicate or salt melts to carbon-rich endmember compositions. Different rock regimes in the crust and mantle generate characteristic ranges of fluid composition, which depending on pressure, temperature and composition are miscible to greatly variable degrees. For example, aqueous liquids and vapors are increasingly miscible at elevated pressure and temperature. The degree of this miscibility is, however, greatly influenced by the presence of additional carbonic or salt components. 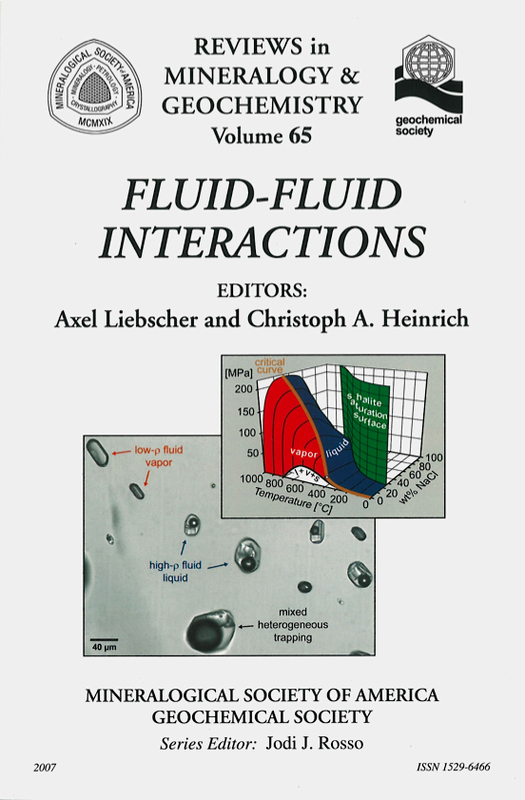 A wide range of fluid–fluid interactions results from this partial miscibility of crustal fluids. Vastly different chemical and physical properties of variably miscible fluids, combined with fluid flow from one pressure – temperature regime to another, therefore have major consequences for the chemical and physical evolution of the crust and mantle. Several recent textbooks and review articles have addressed the role and diverse aspects of fluids in crustal processes. However, immiscibility of fluids and the associated phenomena of m ultiphase fluid flow are generally dealt with only in subsections with respect to specific environments and aspects of fluid mediated processes. 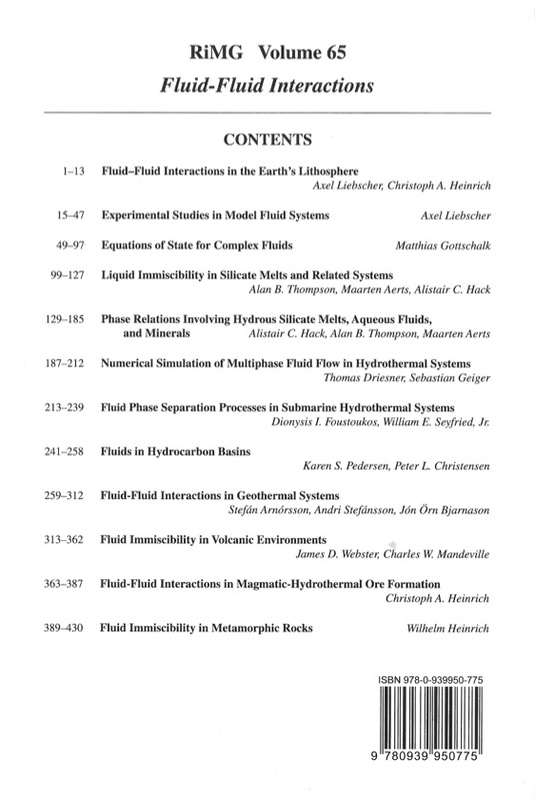 This volume of Reviews in Mineralogy and Geochemistry attempts to fill this gap and to explicitly focus on the role that co-existing fluids play in the diverse geologic environments. It brings together the previously somewhat detached literature on fluid–fluid interactions in continental, volcanic, submarine and subduction zone environments. It emphasizes that fluid mixing and unmixing are widespread processes that may occur in all geologic environments of the entire crust and upper mantle. Despite different P-T conditions, the fundamental processes are analogous in the different settings.